What happens if I can no longer take care of my pet? What are the animal ordinances in my area? What is the importance of yearly wellness check up with a veterinarian? If my pet is brought to the shelter, how long will he or she be there? 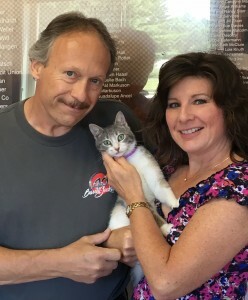 Chloe adopted by Christiansen family in June 2016. The Humane Society may be able to find a new home for your animal. If you are looking to re-home your pet, a surrender fee may be requested depending on your municipality and the pets vaccination history. A monetary donation is always appreciated to offset the costs of finding your pet a new home. Space may be limited so please call immediately if you may need to surrender ownership. Surrenders are accepted by appointment only except in emergency situations. Ordinances regarding animals can vary from area to area. Many townships have specific animal ordinances and citations can be issued for noncompliance. Please click here for a listing of Wood County municipalities. WI state law requires animals to be current on rabies vaccination. Every year millions of puppies and kittens are born; a number far greater than the number of people willing to adopt them. Spaying and neutering your pet is a step towards helping to control pet overpopulation in our area. It can reduce the risks of certain disorders and cancer in both cats and dogs. Animal experience minimal discomfort and heal very quickly from the procedure. Spaying and neutering costs are often included in the adoption fees when you adopt an animal from SWCHS. Many area humane societies offer low cost spay/neuter clinics. A microchip greatly increases the likelihood of your pet returning home if they become lost by offering secure, reliable and permanent identification. The Humane Society provides pet microchipping and registration for just $25 every day of the week except for Sundays and Wednesdays. Schedule your appointment by contacting us today. What is the importance of a yearly wellness checkup with a veterinarian? A yearly wellness checkup ensures your pet is healthy despite any symptoms. Many illness and diseases do not show symptoms when your pet has been infected. Tick borne diseases are prevalent in our region and your pet could be infected but not have any symptoms. A wellness visit can test for these diseases and your veterinarian can equip you with knowledge to care for your pet when symptoms present. The Humane Society strongly encourages pet owners to schedule wellness check ups. Below is a list of Veterinarian Clinics in the Wisconsin Rapids area. Animals that are brought to SWCHS as strays are not adoptable for up to five days to give owners time to locate and reclaim their lost pet. View our gallery of stray animals. If you think your pet may be at the Humane Society please call us immediately. Owners will need to show proof of pet ownership and pay any fees associated with reclaiming a lost pet. We would like to expand this page. If you have a question or topic, please email us.